Police authorities in China are now equipping some police officers with glasses that has facial recognition technology to be used in tackling crime during their new year celebration, state-media report. With up to 3 billion travels expected, the glasses have been issued to officers at strategic places that are highly populated -- places such as the highly populated train station in the Henan province as a part of a security strategy to ensure security during the festive period. State-media reports that about seven criminals on the wanted list and as well as 26 people using fake IDs have been apprehended with the help of the glasses. According to the Wall Street Journal, LLVision Technology, the company behind the technology said the glasses can recognize 100,000 different faces and it takes just 100 milliseconds to identify a person. The introduction of these glasses has met mixed reactions from both China citizens and outsiders. 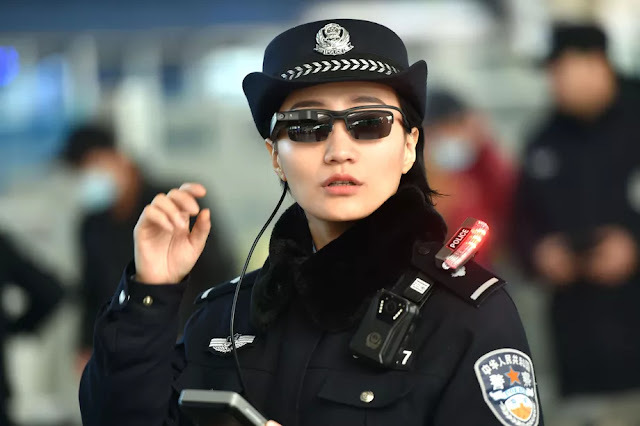 "The potential to give individual police officers facial-recognition technology in sunglasses could eventually make China's surveillance state all the more ubiquitous," the WSJ quoted William of Amnesty International. China's CCTV network is expected to be made up of over 600 million Al-powered CCTV cameras by 2020, is currently able to track citizens, identify their friends, what car they own, drive and other activities. Chinese official described the system as a 'nothing to hide, nothing to worry', and to prove how effective the system was, the officials sent a BBC Journalist Sudworth, Guiyang to see how long he couls stay out of sight. Now this area that the journalist was sent to is an area that has a population of about 3.5 million people and it took the Chinese surveillance team just seven minutes to land him in police custody.